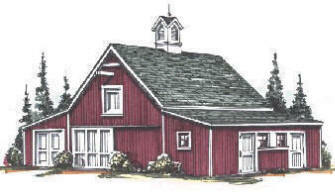 Here's a versatile all-in-one backyard barn for your car, truck or tractor and two or four horses. There's a 20'x24' open center area for storage and grooming and a 20'x24' Loft. There's extra room at the back of the garage for your workbench. 2-Stall Barn Floor Area: 1,008 Sq. Ft., 4-Stall Floor Area: 1,208 Sq. Ft., Loft Area: 480 Sq. Ft.
Plans are $59.00 plus $5.00 for shipping, for three complete sets of drawings. The plans come with a complete money-back guarantee and include a variety of optional add-on sheds, garages, shops, horse stalls and open shelters that help you build any of twenty-five different standard layouts including what's shown above. All twenty-five standard layouts are shown on the plans. You can build any of them, or you can use the main barn/garage plans and any of the add-ons to create your own custom design.